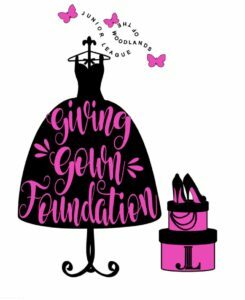 Junior League of the Woodlands is partnering once again with The Giving Gown Foundation to provide a unique experience for high school girls that may not otherwise be able to afford to go to their school formal. They’ll receive dresses, shoes, jewelry bags, toiletries and a fairy godmother to assist them in putting it all together along with an empowerment workshop to encourage them along the way. Thank you to everyone who donated dresses and accessories to The Giving Gown. At this time, donation DropBoxes have been collected. However, donations still are being accepted via e-mail at givinggown@jltw.org.